We’re 7 days into the new year. How’s it going so far? 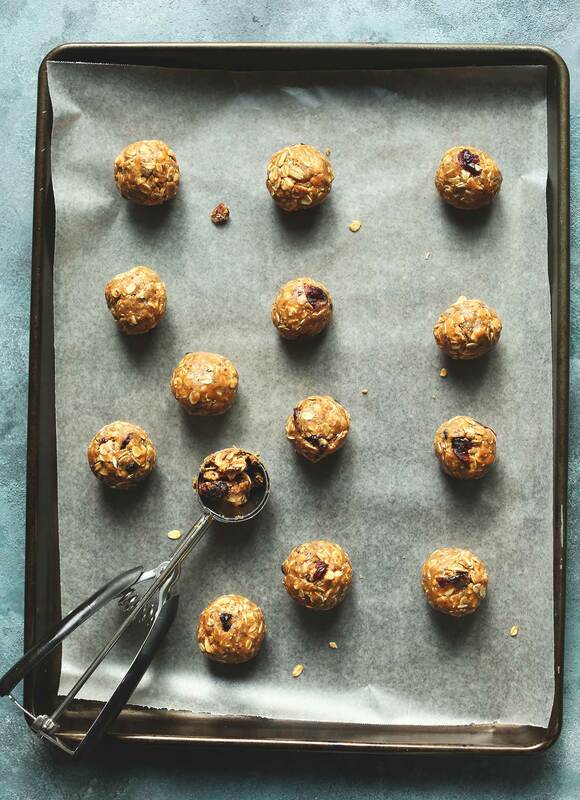 I don’t know if you made any resolutions, but perhaps these wholesome, easy-to-make energy bites can help you stick with any healthy eating-related goals. They’re packed with protein, healthy fats, and fiber, and they taste like a peanut butter and jelly sandwich! Yes, all of your dreams can come true. Let me show you how! 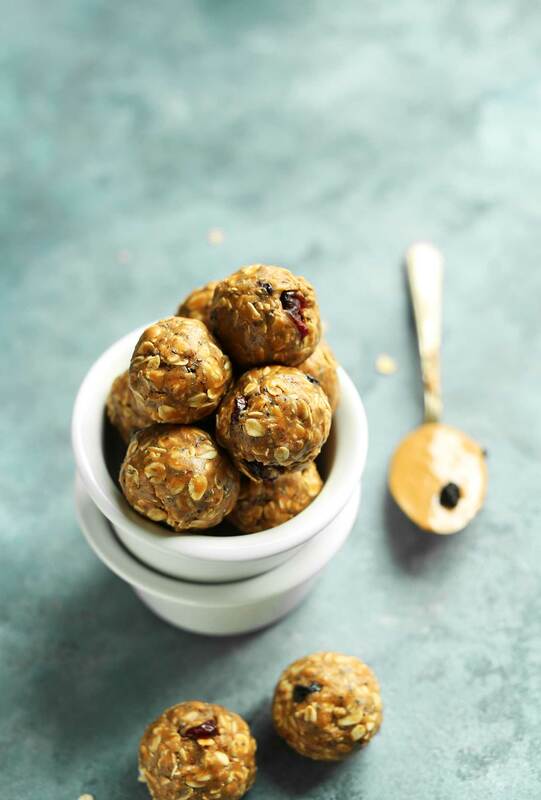 These energy bites require just 7 ingredients, 15 minutes, and 1 bowl to make! The base is peanut butter, maple syrup, protein powder, and oats. Flaxseeds and chia seeds are added for plant-based protein and fiber plus a serving of omega-3 and omega-6 fatty acids! The “jelly” in this recipe comes from dried fruit. I personally love dried strawberries, cherries, and blueberries, but virtually any dried fruit will do. These would make the perfect on-the-go snack or healthy dessert. They pack easily and keep in the freezer for at least 1 month! I personally love reaching for 1 or 2 in the afternoon with tea. They’re the perfect little pick-me-up. Aren’t into PB&J? Try my Mango or Peanut Butter Cup variations! Super into PB&J? Try my PB&J Muffins, PB&J Chia Pudding, and PB&J Snack Bars! If you try this recipe, let us know! Leave a comment, rate it, and don’t forget to tag a photo #minimalistbaker on Instagram. 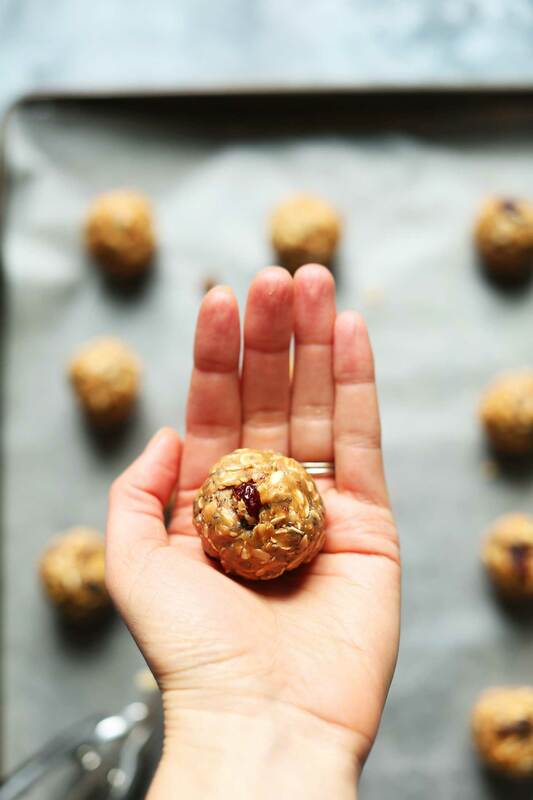 We’d love to see your energy bites in action. Cheers, friends! 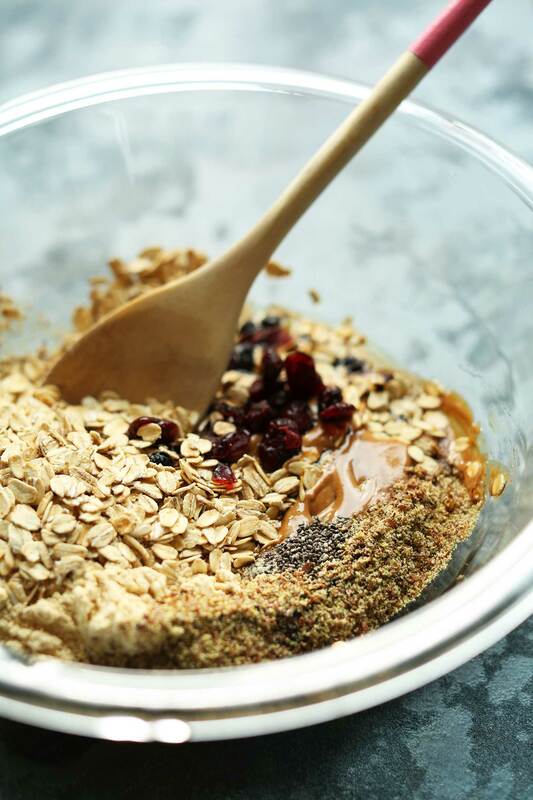 To a large mixing bowl, add peanut butter, maple syrup, protein powder, rolled oats, flaxseed meal, chia seeds, and dried fruit of choice. Mix until well combined. If too dry/crumbly, add more peanut butter or maple syrup. If too sticky or wet, add a little bit more oats or flaxseed meal. Chill in the refrigerator for 5 minutes. Then scoop out 1 1/2 Tbsp amounts (I like using this scoop) and roll into balls. The "dough" should yield about 13-14 balls (amount as original recipe is written // adjust if altering batch size). Enjoy immediately and store well-sealed leftovers in the refrigerator for 1 week or in the freezer up to 1 month (or more). *If gluten-free and cannot tolerate oats, try subbing a mixture of chopped nuts, shredded unsweetened coconut, and more dried fruit. *For protein powder recommendations, check out my Vegan Protein Powder Review post, which notes Bob's Red Mill Protein Powder as my favorite! *Adapted from the lovely Gimme Some Oven. So flavorful, quick, and easy! I used the Bob’s Red Mill Vegan Vanilla Protein Powder (which I really like) and dark maple syrup. It ended up quite sweet, but still good. I’m storing the bites in the freezer because I like the frozen no-bakes texture. These were so tasty and easy to make! So much cheaper than store-bought energy bites, too. Can’t wait to enjoy these for my morning snack during the week! But I must be doing something wrong l, because they won’t hold together for me. I’ve tried adding additional almond butter and flax seed. Any suggestions! Did you follow the recipe or make any changes? These energy bites are delicious! I didn’t have any dried fruit on hand, so instead I used organic dark chocolate chips. PB+chocolate is the best combo ever! Will definitely keep making these. I’ve used Quaker Instant oatmeal with Apple added some raisins and it worked great. Along with rest of ingredients it called for. These are so GOOD. Next time I will make a double batch. I used golden raisins and omitted the protein powder and they tasted great! Dried strawberries so good (and more pb&j like). Where can I buy those? Delicous and so easy!! I used peanut butter and dried cherries. Great combination. Huge hit with my daughter so we have made them again and again…. Sweet and easy! I’m always looking for quick snacks in the morning when I’m on the go. If you love peanut better, this is the recipe for you! I’ve made these twice and they turned out so well both times. I used natural peanut butter instead of the creamy stuff, added half a teaspoon of salt to make up for that sub, substituted honey for the maple syrup, and skipped the protein powder because I didn’t have any. The only thing I found was I had to keep them chilling in the fridge for a bit longer than 5 minutes, about 10 did the trick. They got pretty sticky once the mixture warmed up. That might have been because of the swaps I did. A great recipe, thanks! Im so glad I found this recipe! Its always so exciting when you have all of the ingredients (or most) on hand already. I used raisins for the dried fruit but I didn’t have flaxseed meal but just added a little bit more Bobs Redmill protein powder and they were scrumptious! I was thinking of adding a couple balls to my almond banana shake in the morning too! Made these this weekend. I subbed dates for the syrup and tossed them in the food processor for a minute, then rolled them in hemp seeds for a little extra protein. They were so delicious and were perfect little energy boosts when we started flagging on our 17 mile hike! Thank you!! I own a fitness studio and made these for all of my staff — everyone loved them! Perfect blend of salty and sweet, and love that we get protein in every bite. I’ll definitely be making these again. Hi! Love your recipes :) Where do you find your dried strawberries? I can’t find them where I live and was wondering if you had a brand you like that I could order online. Thanks! Hi! Most bulk stores have them! Alternatively, you could purchase online! Loved these! Would be best to use fresher jar of almond/peanut butter as the oil would help these stick together better. I used the bottom of the jar, so these were a bit drier but were great when eaten straight from the fridge. Just made these, and they are FABULOUS. Used Enjoy Life chocolate chips instead of fruit. My son and husband keep asking me for “one more”…..and then “just one more”…….and then “this is the last one”. Thanks for this fantastic recipe! Great recipe to satisfy a sweet tooth!! I added dried cherries and some vegan chocolate chips… O.M.G! Also had to sub honey since I wrongly thought I still had maple syrup on hand. Came out delicious and I am super excited to try a bunch of variations in the near future! Just made these! Haven’t even formed into balls yet but I couldn’t resist trying them. Yum! I used Honey because we are not vegan and I added some dates I had left over. So easy and good!!!! Do yourself a favor and make these!!! Yes yes and yes. They are perfect. YUM! I love these :) I just made these yesterday – they formed perfectly and taste amazing. I’m going to have one before my workout this evening and try one of your smoothies for afterward. I used half peanut butter, half almond butter. It’s delicious and so easy! Perfect little sweet snack at work! Thank you. Simple & Delicious. I used Red Raspberry Preserves instead of dried fruit and a bit of honey instead of maple syrup . Just made these today with cranberries, Orgain vanilla protein powder, an for two tablespoons wheat germ (since was a little wet). They are amazing and will be a staple from now on! I agree with the person above regarding nutritional info – I think it’s a little under estimated…just FYI to anyone counting calories/points. They are too good! Made these, and ever since, always have home-made power balls (that’s what we call them in our house) of some sort in the fridge ready to go. We use peanut butter or almond butter, lots of seeds and nuts, sometimes raisins, sometimes chocolate chips, vegan protein powder, coconut, honey or maple syrup…the combinations are endless. Thank you! Dana, you have a way of making simple ideas work well. This is really fantastic. It’s pretty much a granola bar in ball form, if you think about it. I used to make your granola bar recipe all the time (with the toasted almonds and all), and it’s delicious but kind of a pain. This, while not quite as good because of the “fake” taste of the protein powder, is significantly easier to throw together (and I had all the ingredients in my pantry already). I will probably start making batches of these for my kids and me to use as quick snacks. I used raisins and Bob’s Red Mill vanilla protein powder. I would probably prefer a different dried fruit but raisins are what I had :) I thought about using chocolate chips but there’s a certain element of oatmeal raisin cookie to them that I quite like. I followed the recipe exactly and did have to add a bit more PB and maple syrup to make them sticky enough. When I make more I’ll play around with the flavors — there are a lot of possibilities! So good! Can’t wait to use these as my pre-workout this week. I’ve never used chia seeds or flaxseed meal and I considered just making these without them to save money, but I sprung for them and I’m glad I did. The chia seeds add a nice texture and neither of them affect the taste in any negative way. Definitely worth it for the protein boost. Question: Is it sufficient to store these in a tupperware container in the refrigerator? Hi Emily! Yep – you can store them in a well-sealed container in the refrigerator for 1 week or in the freezer up to 1 month (or more) ..that is, if they make it to the freezer ;) Trust us, they’re GOOD! Happy No-Baking! I made this with honey instead of maple syrup and they turned out delicious! I didn’t have protein powder or wheat germ, but made them without those. I used dried cherries and added a handful of chocolate chips at the request of my son. We loved them! These are so much better than buying granola or protein bars! Thanks for another great recipe. Oops I meant flax seed not wheat germ! I’ve been enjoying these with my tea every afternoon at work-if I only bring one, I can’t over indulge! These are fabulous, love your recipes. Hi this recipe was fantastic! I added mashed banana and some dairy free chocolate chips and wow we all left it thanks so much for sharing! I love this recipe! Only problem is I want to eat them all. What kind of peanut butter do you use? Yours came out smoother than mine, I’m curious what other brands to try. Thank you soooo much for creating a recipe using the Vanilla Protein Powder! 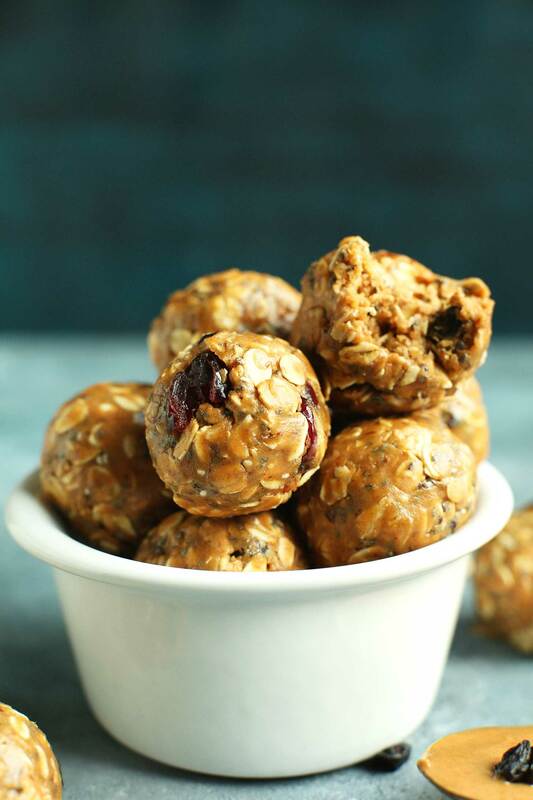 My plan is to make these PB and J Energy Bites this weekend for my “sugar-free” days next week! Okay, dried fruit and protein powder are technically sweet… but a step in the right direction! So glad you created this recipe using your chosen protein powder! Love your recipes! I don’t have flax seed meal could I subs chia instead? Or any Other options? Hi! Substituting the flax seed meal with more chia seeds should work! I haven’t tried it but if you do, let me know how it goes! These were excellent! FYI – I used date syrup in place of maple syrup (exact same amount) and it worked perfectly. Should I add salt if I am using unsalted peanutbutter? I loved this recipe! I made it and everyone at home and at work really enjoyed it. It’s easy to make (it doesn’t get any easier than that, really!! ), it’s quick, simple and healthy ingredients and it’s tasty!! Fantastic as usual! Thank you Dana. I used almond butter and golden raisins. Yaaaaaay! You made me an official recipe. I will definitely try this the next time I make energy bites. Thank you! I made these bad boys last night, super easy and quick to throw together. I’m excited to give some other add on ingredients a try! Used Vanilla Vega Sport Performance protein powder and everything blended together very well. Another hit Dana! Kids and adults will love this. This recipe is very easy and can be done by anybody. You will sure get your energy back with this small bites. Just wanted to say I tried these out whilst out mountain biking and not only are they delish they do seem to sustain your energy as well. 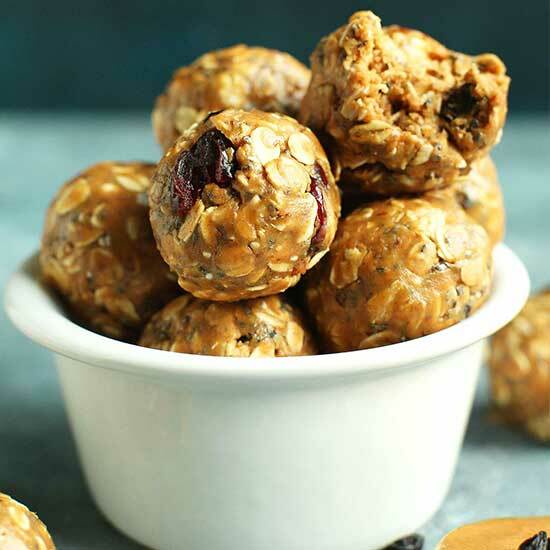 Just made these, love energy bites! I left out the dried fruit and used Vega One Chocolate, so they were more chocolate pb bites….delicious ? My grandson managed to delete my detox guide after I signed up to receive emails. I unsubscribed in order to subscribe again, but nothing is happening. Could you please add me to your email list again and send me another detox guide? I use your everyday cooking book and love the recipes, thank you! I don’t currently. Sorry, Linda! Very delicious, I love your recipe. It is easy to make and affordable. My 3 year old couldn’t stop eating these ? But neither could I! ? Thank you, Dana! We have been trying to eat down our pantry and this was perfect! My roommates and I recently merged homes, so we have like 3 jars of peanut butter with 1/4 cup left in 2 of them. I also used vanilla flavored protein powder so it was super rich with the maple powder. Next time I will try to change the protein powder (or incorporate maca root powder?) or just add more peanut butter to tone down the sweetness. We used golden raisins, so delicious! I’m thinking next time I will try some chopped nuts of some sort .. almonds? Sunflower? Crunchy peanut butter would be great way to add texture too! Was wondering if these are bake-able? All of those subs sound awesome! Let me know how it goes. Not sure on baking them. They might just end up getting dry. But if you try it let me know! Just whipped these up, delicious guilt free treat. Love all of your recipes ? WOW these look absolutely awesome! raisins and it was great! So easy – thank you! Just made them they are healthy tasty and very delicious treats. I used maca powder and dried goji berries. It’s a super healthy treat packed with goodness. Thanks for the recipe Dana. Smart! I’ll have to try that next time! Hi! I’m new to the site and love all of your recipes but for some reason when I go to print them they appear blank. I am a little technology challenged so any help would be appreciated! Thanks in advance. Hmm, try refreshing the page. Also, it may depend on the browser you’re using. Try safari or chrome! My little girls loved these like they were cookies ? So simple and healthy. I also made your curry lentil & potato soup the other day. My family loved both. So happy I found your site, I’ve recommended friends visit too. These are absolutely amazing and very easy to make. Anyone to bakes/cooks often will have all of these ingredients in the cabinets! Perfect Vegan snack to add into my diet! Read this and was instantly back in the kitchen. Delicious! Now brb, gotta go make some balls. Yummy! I added a teaspoon of flax, since I wasn’t too sure if I’d like the flavor. Next time I’ll add more. I have a lot of protein powder (SunWarrior: Vanilla) that I don’t regularly use, but with these protein balls I’ll definitely be using it now! I can’t wait to use it all up, and someday buy the Bob’s from your review! Yum! Used pb2 powdered peanut butter and these turned out fantastic. thanks for sharing your substitutions! I forgot to rate it…5 stars definitely and so many variations possible. Is great for kids. Ha! Agreed. Thanks for sharing, Pauline! Just moments after I read this recipe, I was up at the cupboard, pulling out ingredients and pulling these together. Subbed hemp seed hearts for the flax meal, Vega greens, and the last of the raisins. Easy, awesome, and everything you could want in a treat. Well done, Dana! Just made half a batch with GF oats, dates, and chopped figs. SO YUMMY. tastes like pb cookie dough with figgy magic and Chia. thanks for the great snow day recipe! Have no dried fruit on hand would be good with dates? oh yeah!! chop them pretty fine and you’re good to go!